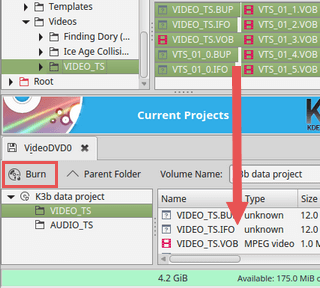 This tutorial will show you step by step how to burn VIDEO_TS files and folders to a DVD that will play on any DVD player – in a few different ways using free and paid software. This tutorial will also show you how to burn VIDEO_TS to a playable disc without downloading, installing, and using any special third-party software. If you download movies from the internet, then you might know about VIDEO_TS folders and files. A VIDEO_TS folder is a folder that contains three kinds of VIDEO_TS files which are required to play Video DVD movies. There is normally also an AUDIO_TS folder that might contain Video-DVD audio files, but usually, this folder is empty. 3. In the left menu, you go to Movie + Slideshow and then choose Video DVD from Folder. 4. Enter a title for your DVD at Title located underneath Title of the burned Video-DVD. 6. Go to the location on your computer where the VIDEO_TS folder is stored you want to burn to a DVD. 7. Select the VIDEO_TS folder and click on OK.
Cache data to copy all data to hard disk image first (slower, but can prevent write errors). 10. Click on the Write DVD button located at the bottom right. Ashampoo Burning Studio will now burn your VIDEO_TS folder and files to DVD. 3. In the left menu, you go to Movie and then choose Video DVD from Folder. 9. Click on the Write DVD button located at the bottom right. A new compilation window will appear. If not, then click on File located at the top left and choose New from the drop-down menu. 5. Click on New located at the bottom of the new compilation window. 6. In the left section of Nero, you click on the VIDEO_TS folder. 7. In the right section of Nero Burning Rom, you go to the location on your computer where the VIDEO_TS folder is stored you want to burn to a DVD. 8. Open the VIDEO_TS folder. 9. Drag all the files from the VIDEO_TS folder stored on your PC to the VIDEO_TS folder in Nero Burning Rom (second section from the left). 10. Click on Burn located at the top or click on the Burn Now button at the bottom right. Verify written data this will verify if the VIDEO_TS folder and files are burned to your disc correctly. This will take more time, but this way you are sure that you will have the correct copy before you delete the VIDEO_TS folder from your hard drive. 12. Click on the Burn button located at the bottom of the Burn Compilation window. Nero Burning Rom will now burn your VIDEO_TS folder and files to DVD. 5. Go to the location on your computer where the VIDEO_TS folder is stored you want to burn to a DVD. 3. Select Video DVD and click on OK.
A Burn Video DVD window will appear. 4. At Disc name, you enter a name (title) for your DVD. 5. Click on the 3 dots button located next to VIDEO_TS folder. 8. Click on the Burn disc button located at the bottom. CDBurnerXP will now burn your VIDEO_TS folder and files to DVD. 4. Double click on the VIDEO_TS folder to open it. 5. Click on Add Files located at the top. 7. Open the VIDEO_TS folder. 8. Select all files (VIDEO_TS.BUP, VIDEO_TS.IFO, and VIDEO_TS.VOB) and click on the Add button located at the bottom of the window. 9. Click on the Close button to close the window. 10. Click on Burn located at the top left. BurnAware will now burn your VIDEO_TS folder and files to DVD. 2. Go to the location on your computer where the VIDEO_TS folder is stored you want to burn to a DVD. 3. Right-click on the VIDEO_TS folder, go to Send to and choose your DVD burner drive (example: DVD RW Drive (E:)). A Burn a Disc window will appear. 4. At Disc title, you enter a title for your DVD. 5. Select With a CD/DVD player and click on the Next button. Windows will now copy the VIDEO_TS folder to the DVD burner drive and after it's finished it will open the DVD burner drive in a new window. 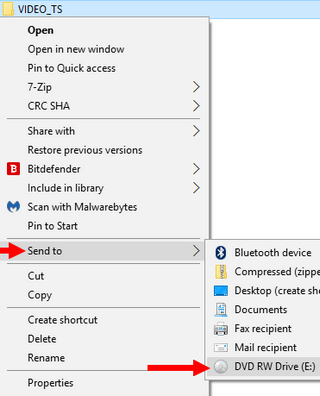 If it doesn't open in a new window, then you can find it at My Computer or This PC or in the left-sidebar of Windows Explorer or File Explorer. 6. Click on Manage located at the top. 7. Click on Finish burning. Microsoft Windows will now burn your VIDEO_TS folder and files to DVD. 3. Click on New Project and choose New Video DVD Project. Or click on File located at the top left, go to New Project and choose New Video DVD Project. 4. In the top left section of K3b, you go to the location on your computer where the VIDEO_TS folder is stored you want to burn to a Video DVD. 5. Click on the VIDEO_TS folder. 6. In the bottom left section, you click on VIDEO_TS. 7. Drag all the files from the top right section to the bottom right section. To select all files at once, press the [CTRL] + [A] keys on your keyboard. 9. Make sure that your DVD is selected at Burn Medium. 10. If you want you can select a burning speed at Speed and you can also change a few other settings. 11. When you're ready, you click on the Burn button. K3b will now burn your VIDEO_TS folder and files to DVD.